New "Daedalus" suit will set you back more than $440,000. If you’ve always dreamed of strapping a jet on your back and soaring high into the sky like a superhero or secret agent, listen up. Selfridges, a posh department store in London, is now selling a personal jet pack, or jet suit, that will let a handful of well-heeled customers live out their "Iron Man" fantasies. The jet suit retails for a stratospheric £340,000, the Evening Standard reported. That's about $443,000 at the current exchange rate. Supplies are limited: Only nine of the custom-made suits are available for sale. 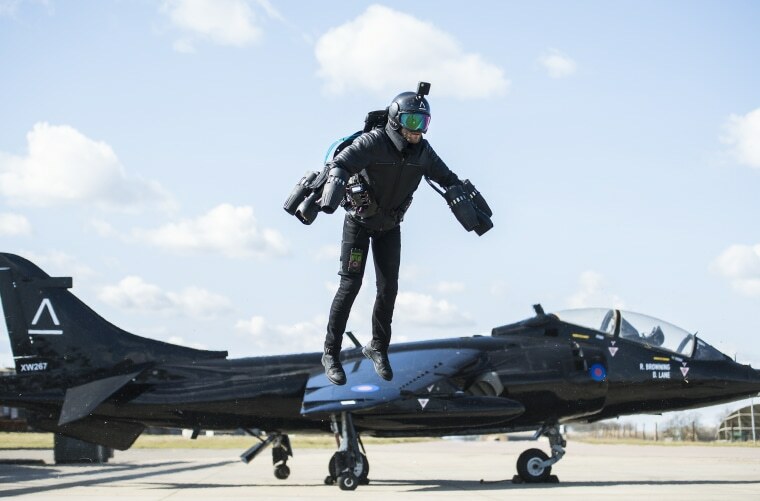 Designed by English inventor Richard Browning and made by Gravity Industries, a Salisbury, England-based tech start-up he founded in 2017, the jet suit consists of five small kerosene-fueled turbine engines — two worn on each arm and one on the back. It produces more than 1,000 horsepower, according to Selfridges. It can be used for flights of up to four minutes, Reuters reported. The suit, dubbed “Daedalus” after the artist in Greek mythology who built wings of feathers and wax, is said to be able to lift a person up to 12,000 feet in the air — though users may want to stay closer to the ground. “It’s an entirely pure form of complete three-dimensional freedom,” Browning told NBC News MACH in an email. He said the suit represents a “whole new area of human mobility” but acknowledged that it could take a while before jet pack travel really takes off. “Just like the first motor cars, which were noisy, smelly and inefficient…we have some way to go before you could commute by jet suit,” he said. Browning has given many demonstrations of the suit over the past year. In November 2017, he used it to establish a world record for “fastest speed in a body-controlled jet engine power suit,” zipping over a lake in Reading, England at 32.02 miles per hour. Flying the Daedalus suit doesn't call for superhuman strength, according to Browning. The effort required is “less than holding yourself up with straight arms off the back of two chairs,” he said. But neither jet packs nor rocket belts caught on, in part because they proved to be difficult to maneuver. Daedalus isn't the only jet pack out there. Jetpack Aviation of Van Nuys, California recently sold one of its JB-10 jet packs but is holding off on additional sales until a parachute can be incorporated into the design. And last year, Boeing announced a two-year competition to spur development of personal vertical take-off and landing (VTOL) devices.